New story details from The Mandalorian may have been revealed for Taika Waititi's episode. Over the past few days, there have been some pretty interesting leaks from the set of the live-action Star Wars TV series, which is currently filming in California. Gina Carano recently joined the cast and Narcos actor Pedro Pascal has reportedly been cast as the lead in the upcoming show, but story details are lacking at the moment, and Star Wars fans are looking for some more info. In the latest set video from The Mandalorian, Taika Waititi, Jon Favreau, and Dave Filoni are seen on set, getting ready to film some shots. They appear to be setting up an action scene with a few Stormtroopers, without helmets. There are a few other unknown actors spotted in the video as well, along with another actor wearing partial Mandalorian armor. The video has some music going over it, so you can't hear what's going on. However, Making Star Wars says that there was a lot of laughing going on. While it's not easy to see what exactly is happening, it looks like The Mandalorian's season finale will take on the Empire, or whatever is left of it. This shouldn't come as too much of a surprise, but it certainly is pretty interesting. The live-action Star Wars series takes place after the fall of the Empire and before the rise of the First Order. While The Mandalorian is the hero of the new show, it's clear that he isn't one of the good guys, or at least isn't going to bow down to whatever is left of the Empire. As with all set pictures and videos, the latest leak from The Mandalorian doesn't come with any context and doesn't spoil anything. Instead, it raises the mystery of what we're going to see when the show is finally released. At this time, there is no release date set for the series, but it may arrive at the end of 2019 when the Disney+ streaming platform is unveiled. Whatever the case may be, it looks like the wait is going to be worth it. 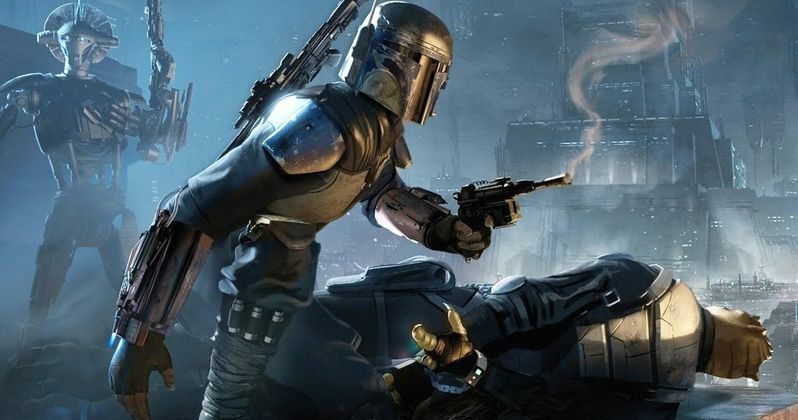 The Mandalorian isn't the only live-action Star Wars show that Disney is currently cooking up. It was recently announced that a Rogue One prequel series starring Diego Luna is also in the works. The show is expected to go into production next year and will follow Cassian Andor during the formative years of the Rebellion. It's believed that The Mandalorian has a budget of $100 million, which means that the Rogue One prequel series will more than likely be in the same ballpark with awesome production values. These new shows could end up being huge successes for Disney and their new streaming platform, but the Star Wars fans are the real winners with both shows. You can check out set video from The Mandalorian below, thanks to the Making Star Wars YouTube channel.